The revolution in battery technology still is not here which means, battery efficient services are very important. Smartphones, Tablets and Tablets, all of these devices do have something in common, they are all dependent on their battery. Modern devices are lasting pretty long already, however if you are doing some heavy work on your laptop or tablet it might not last very long. Additionally the browser is a more and more important tool for web apps, various websites, video platforms and so on. The browser is probably the most used application on a PC as long as you don’t need any specific application for something. Now this proves once again that Microsoft Edge isn’t just Internet Explorer with a new name and theme but that the company really invested a lot of time and energy in that project to make it the best browser ever. 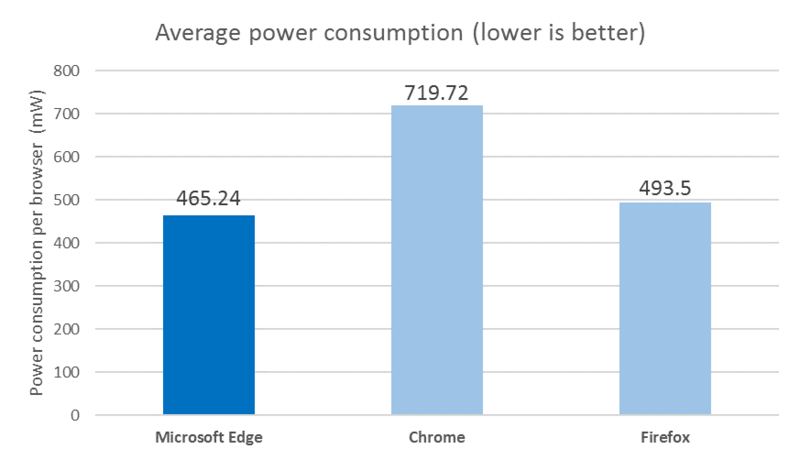 Microsoft tested the energy consumption of all four major browsers, Microsoft Edge, Mozilla Firefox, Opera and Google Chrome, Safari is not included. While simply testing the energy consumption of browser is one thing, Microsoft invested some effort in giving a very objective view on that. First of all they have tested the energy consumptions of all four browser in their lab to get a first impressions what browsers can do under controlled and optimized conditions. Secondly Microsoft considered all the user data they are getting from over 300 million device which are running Windows 10 already. The result was pretty clear, and declared Microsoft Edge as the best battery saver ahead of Firefox. Google’s Chrome browser was by far the browser with the highest battery consumptions. Now you could say, well it’s Microsoft why should their browser lose this test anyway. However this company is not the only one declaring Microsoft Edge the most battery efficient browser. Recently the Wall Street Journal published a reasearch showing the same results as Microsoft has got. You can expect the Wall Street Journal to be more objective than Microsoft which should convince even those who are sceptic about the research results from Microsoft. The Redmond tech company also released a short video showing off all four browser running on a Surface Book. All four browsers are running various videos for a couple of hours, until you can see switching off one Surface Book after another. After 07:22:07 there is one last Surface Book remaining which has a video playback running in Microsoft Edge. Comparing this to the time of Google’s Chrome browser which had a time of 04:19:50 you can see that there is real potential in saving energy on the go with the right browser choice. What do your readers think about this research from Microsoft? Is this something which can influence your choice of browsers or are you sticking with your loved one no matter what happens? Drop us a comment below with your thoughts and stay tuned for more Microsoft related news in the future.